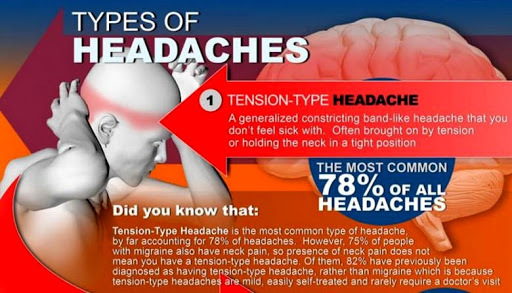 Headaches are very common - like 90 percent of the population common. Just because headaches are common, though, that doesn't mean you should be caught off guard when your next painful bout hits. So, here's everything you need to know about every kind of headache, including tension-type headache, migraine headache, sinus headache, chronic daily headache, and the dreaded cluster headache. Ninety percent of the population experiences a headache at some point in their lifetime, however, certain people have to deal with headaches or migraines that are a lot more severe than others. Half of the global population has suffered a severe headache at some point, 25 percent suffer from recurring severe headaches, 12 percent have migraine headaches, and four percent have chronic daily headaches. Although there are both over-the-counter and prescription medications designed to treat specific types of headaches, there are also easy at-home remedies that can help alleviate the throbbing pain that just won't quit. The next time you're struggling with a headache, try: relaxing and resting, an ice pack, moderate exercise, dietary supplements, hydration, pressure points/gentle massage, taking a hot shower, or diet; multiple small meals.